The race is well organised but also has a quirky laid-back feel. Directions to the start and the main ‘organisation’ tent were clearly marked out and we were given our race packs including race numbers and a t-shirt while stirring Spartan-esque music played to get us in the warrior spirit. Lots of portaloos on hand and the staff are helpful. Out on the course it’s more laid back but more on that later. Races are held in waves throughout the day and they co-coordinate the start and finish times of each so that we didn’t have to wait around for our race to begin. There aren’t any shower facilities for post race but being on an army base there is a hose! The course is about 3 miles long with about 15 different challenges like climb a rope, carry a tyre up a hill or scale a wall. The obstacles are a bit random and some seem to have been dreamt up minutes before the race but it could be considered part of the charm. There’s no real consistency to the course so one minute you could be scaling a steep hill in a wooded area whilst lugging a heavy bag on your back, and the next you could just be running on flat ground. 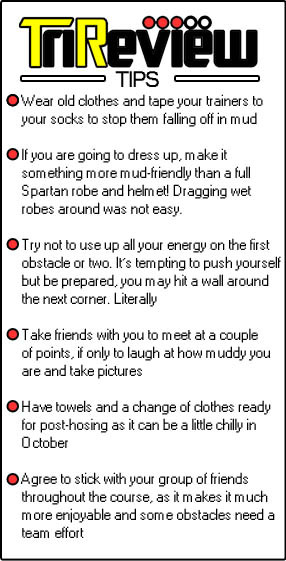 Most of the toughest obstacles are out of the way in the first half so by the second half you can ‘enjoy’ negotiating the muddiness of the rest. 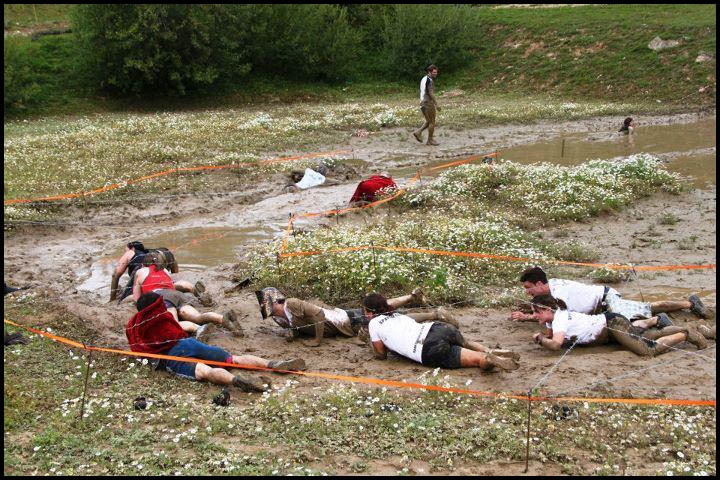 The highlight is a 50 meter crawl through the mud under barbed wire (see picture). Unlike a lot of races, this one was not spectator-friendly so there were no crowds to cheer you along the way. The atmosphere at the beginning was fantastic though as a lot of people get into the ‘Spartan spirit’ with the music playing. It’s quite a small race so big groups are able to stick together and tackle the mud and obstacles as a horde. Although it’s called Spartan Sprint not many people actually dressed up which was shame but the few who do definitely add to the fun factor. The combination of running and the obstacles will challenge most people but it’s considered tame in comparison to the likes of other assault course races like TOUGH GUY. Some of the challenges are easy accomplished in a group so I can’t imagine it would be much fun to run alone. The final challenge which was a 12 foot climb over a slippery wall which was hard even for a large group and many of us had to go around which was a shame. You can’t really train for it just do a bit of running and make sure you’re up for anything on the day. Once we’d finished the race we were so muddy that the only option was to line up and be hosed down by the fireman-strength hose they had waiting. All good fun but pretty uncomfortable when we remembered it was September. Apart from taking some hilarious pictures of the freezing hose-down there’s nothing to do after the race so you’re best off driving to the nearest village to get warm and get some lunch in a pub. Leeds isn’t too far away either (45 mins) so it’s worth making a weekend of it and staying overnight in the city before race day. This was my first 5k obstacle course run, previously the farthest I’d run was a 5k race for life. 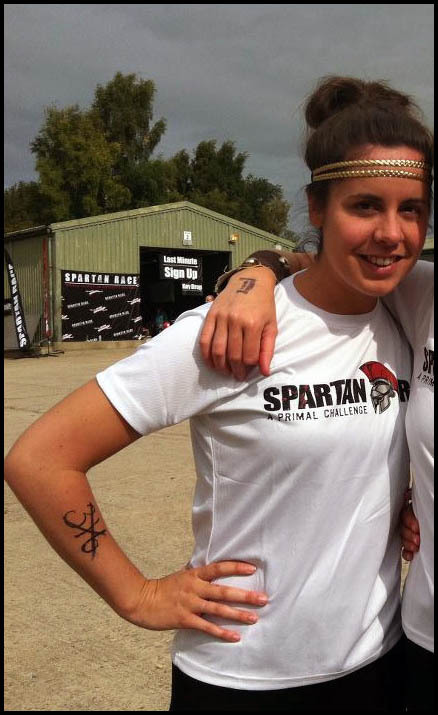 As I was running with 9 others and dressed as Spartans we were able to get into the spirit of the race and it made it lots of fun! Some of them were marathon-distance runners but as we’d agreed we were doing the race for fun and not to compete, we all stayed together so that the slowest members of the team (me!) didn’t feel left out and we could enjoy it together. The first half of the race was difficult as there was a lot more running but as soon as the obstacles kicked in I enjoyed it a lot more.